A popcorn ceiling, also known as an acoustic ceiling is a term for a spray on or paint on ceiling treatment used from the late 1950s into the 1980s in American residential construction. Popcorn ceilings become unattractive when they get dirty, are easily damaged by water and humidity, and are hard to clean, repaint, or repair. 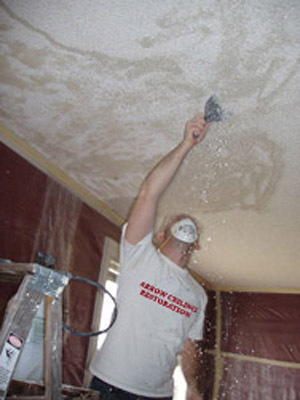 At Arow Ceiling we can assist you with popcorn ceiling removal or repair in your Belleair home. Once your Belleair home's popcorn ceilings are removed and minor drywall repair is completed, we can replace the ceilings with a beautiful textured ceiling finish to compliment the rest of your Bellair home. Please take a look at the types of textured ceiling samples that we offer. Popcorn ceiling Removal is a process that should be left to the experts of Arrow Ceiling, because of the mess and the technical expertise needed. To all our customers, we thank you for 24 great years in the Belleair and Surrounding Areas! Contact your Belleair Ceiling Contractor about Popcorn Ceiling Removal, and Texture Ceilings and Walls. If you're looking for a Belleair Ceiling Contractor Specializing in Popcorn Ceiling Removal, Popcorn Ceiling Repair, Drywall Repair, and Texture Ceilings and Walls, contact Arrow Ceiling Restoration today at (727) 804-5411, or complete our estimate request form.